When did the first true plants appear on land? Fossils called Cooksonia, found in Ireland, were probably the first true macroscopic plants to colonize land about 425 million years ago. Other plants also appeared not long after, including flowerless mosses, horsetails, and ferns. They reproduced by throwing out spores or minute organisms that carried the genetic blueprint for the plant. The ferns eventually developed seeds, but this did not happen until about 345 million years ago. Vascular plants—those with roots, stems, and leaves—evolved about 408 million years ago. 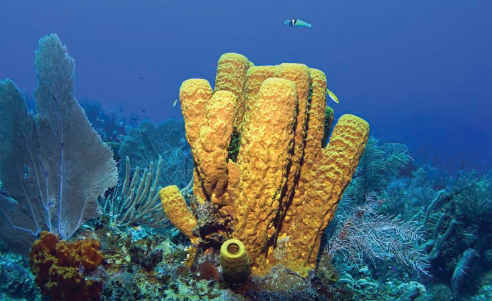 This yellow tube sponge, found near the Cayman Islands, descends from sponges that were among the first multicellular life on the planet (iStock).